When it comes to weirdness, Citroen has form. Take, for example, the 2CV Sahara launched in 1960. 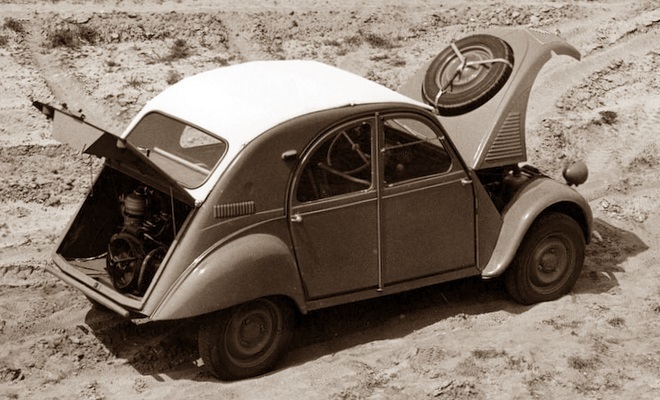 Needing an off-road car to sell in North Africa – where the roads tended to mix slippery dust with rocks and bigger rocks – the French engineers simply bolted a second engine into the boot of a tin snail to provide power for the rear wheels. And that was Citroen’s answer to the Land Rover. Of course there was a bit more to the business plan, but not a whole lot more. Engine number two came complete with its own entirely separate petrol tank and even its own gearbox. Sensibly, there was just a single gearstick, to avoid the embarrassing prospect of setting off both forwards and backwards at the same time. It was also possible to leave the rear engine dormant when not off-road. The 2CV Sahara might sound like a half-baked lash-up from a bygone era, but the exceedingly modern DS5 Hybrid4 is surprisingly similar at heart. Today the engine in the boot is an electric motor. And in place of a second fuel tank there’s a 1.2kWh bank of nickel-metal-hydride batteries. And thankfully there is still some boot space left over for luggage in today’s hybrid – 325 litres, to be precise. 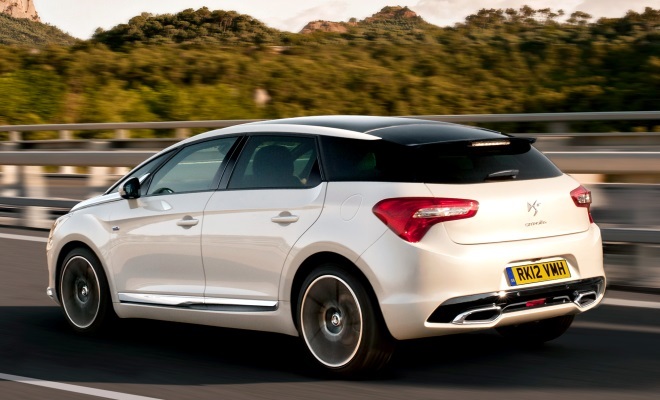 But underneath its modern gloss, the DS5 hybrid shares the same push-me-pull-you philosophy as the Sahara. Like that earlier Citroen, the DS5 is by nature a front-wheel drive car. Even in Hybrid4 format, most forward progress is achieved through the efforts of a 2.0-litre, 163bhp four-cylinder turbodiesel. Power reaches the front wheels via a six-speed automated manual gearbox. At the back, the 27kW (37hp) electric motor drives the rear axle independently, its contribution to propulsion governed by clever software and very little else. There are no driveshafts connecting front and rear, but one important electrical connection comes courtesy of a second electric motor nestling up against the engine. This 7kW unit acts as a powerful starter motor, removing any need for chug-chug-whir as the hybrid’s engine starts and stops, but also doubles as a generator, sending power rearwards to the drive battery when needed. Having this extra motor/generator up front reduces dependence on rear-axle regenerative braking. And this is undeniably a good thing. Producing a strong braking effect on the rear tyres alone is welcome only if you enjoy barrelling backwards through hedgerows. On top of this unusual powertrain Citroen has built an equally unlikely body. The ingredients certainly don’t sound promising. There’s a stumpy hatchback tail, a long overhanging nose, wandering creases along the bodywork and a big chrome tick glued on the side. But somehow these oddments gel together into a striking whole that is both quirky and handsome. Inside, the designers have been equally bold and almost as successful. 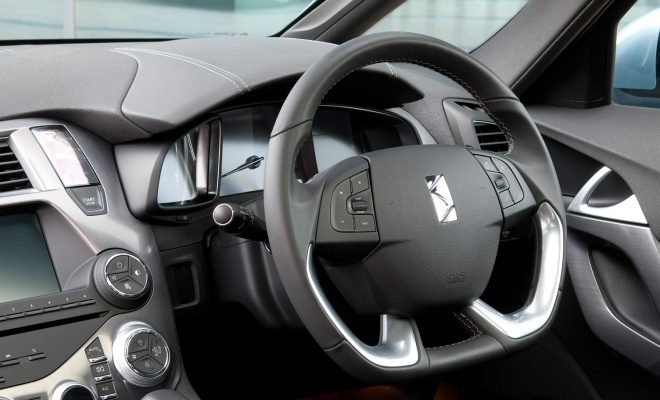 The DS5 interior looks and feels special, with interesting shapes, high-quality materials and well-chosen textures. Shark-tooth switches are a visual and tactile delight, appearing both above your head and beneath your elbow. All of this loveliness is not without the odd sour note, however. The oblong analogue clock and apologetic starter button, grouped together to the left of the wheel, both feel like afterthoughts. 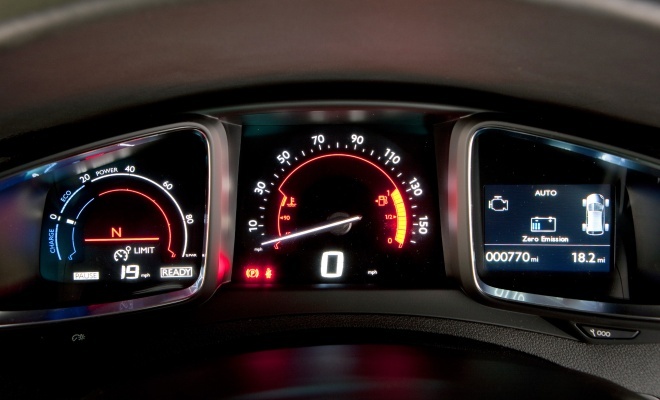 The instruments are also a little suspect – presenting a riot of colour and light where simple clarity is needed – and I’m also not a fan of the flat-bottomed steering wheel. Call me stone-aged, but surely wheels ought to be round. Hybrid4 models start at £27,600, which feels like a lot for a Citroen until you step inside, where you might just persuade yourself that it is all money well spent. My top-of-the-range test car, in DSport trim, costs from £32,200. As you might imagine, the standard equipment list is reasonably generous, to try to give this pricey French car a fighting chance. Rolling on British blacktop the ride felt much firmer than I expected of a Citroen – perhaps a fault of the 18-inch wheels fitted to my test car. Smaller 17-inch rims are a no-cost extra that ought to create less judder over bumps, and happily they will also trim the official CO2 score down to a remarkable 91g/km, with combined-cycle economy of 80.6mpg. Real-world economy will no doubt be considerably worse, but I can’t say by how much as I spent most of my route fiddling with the driving options rather than watching the trip-meter. 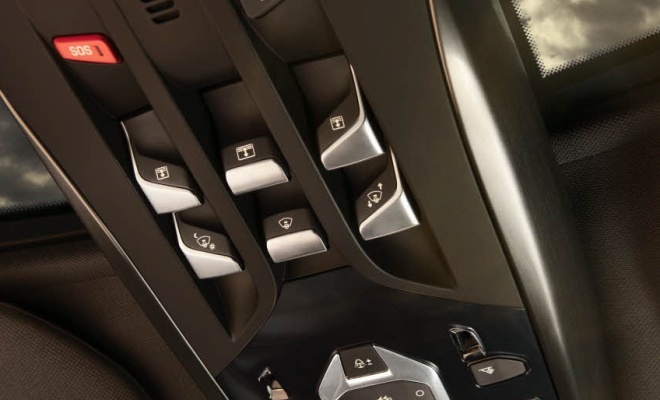 First of all, there’s a manual transmission mode, accessed by pulling the slender transmission wand back from A for automatic into M for manual. Alas a clutch doesn’t spring up from the floor, but you can instruct the gearbox to swap cogs via a pair of paddles. An additional rotary controller, meanwhile, allows the drive to switch among Auto, Sport, ZEV and 4WD modes. 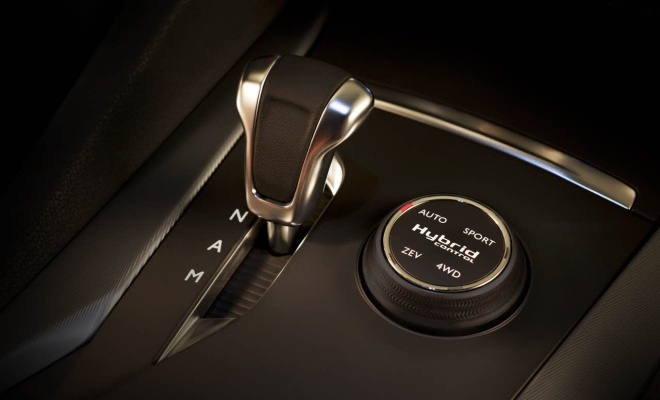 The Sport setting makes a very noticeable difference to the throttle response – switch modes with a steady foot and the car will surge forward like a startled rat. You’ll always find yourself back in Auto on startup, and this is the mode where the Hybrid4 system does its best to achieve maximum economy. The engine will frequently fall dormant at low speed, in contrast to the Sport mode which keeps battery power in reserve for bursts of quite rapid acceleration – engine and motor combined produce 200bhp. 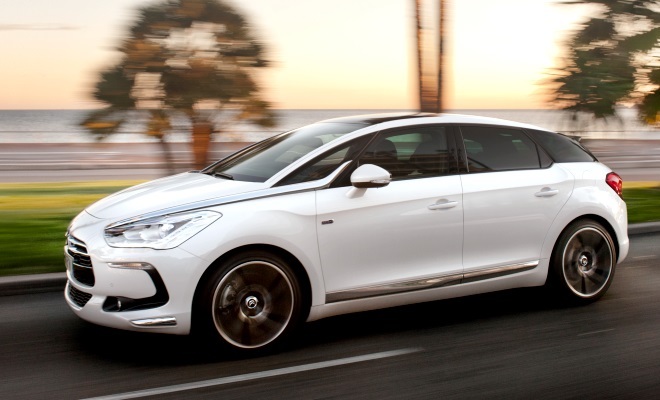 ZEV – zero-emissions vehicle mode – switches off the diesel engine, allowing the DS5 to be piloted on electric power alone at speeds up to 37mph, for the mile or so it will take for the battery to run down. And finally 4WD will send power to the rear in slippery conditions. These final two options are only available if there is sufficient juice in reserve. If the cupboard happens to be bare, the instrument panel will politely note that your chosen mode is unavailable and dump you back into Auto. If you’re asking for 4WD because you’re stuck at the foot of a slippery slope, there’ll be no choice but to sit idling the engine until the little 7kW generator has topped up the battery. But if you’re asking for ZEV because – well, I’m not sure why you’d need it, but let’s imagine you’re in a no-emissions zone – you’d better get out and push. After a few miles of prodding and twisting and sucking and seeing, I can’t recommend doing anything other than leaving the DS5 hybrid in its default settings. Unless you happen to be stuck at the foot of the aforementioned slippery slope, Auto is generally the best bet. 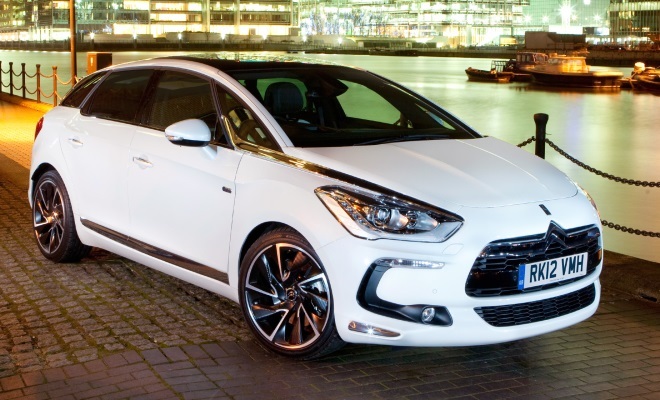 Despite 200bhp power, a firm ride, a Sport mode, and the presence of paddles, the DS5 is not remotely sporty. Flapping at the paddles felt a little too much like milking a cow, while the auto seemed to lose its thread between ratios, producing an uncomfortable rowing motion in place of full steam ahead. At the end of my test, I wasn’t entirely persuaded by the DS5 hybrid, but neither was I entirely turned off. It certainly offers bags of character. If you like the looks, don’t need a lot of space and are content to drive at a modest pace, then the DS5 Hybrid4 is definitely worth considering.